Home > Articles > NTSE Himachal Pradesh Stage 1 Answer Key 2017-18 - Check Revised Answer Keys Here! NTSE Himachal Pradesh Stage 1 Answer Key 2017-18 - Check Revised Answer Keys Here! NTSE Himachal Pradesh Stage 1 Answer Keys 2017-18 have now been released for the exam conducted on 5 November 2017. The candidates who were waiting for the release of NTSE Himachal Pradesh Stage 1 Answer Keys can now check the same on this page. With the help of answer keys, the candidates will be able to tally the scores and judge their performance. Candidates are advised to scroll down for NTSE Himachal Pradesh Stage 1 Answer Key 2017-18. This page has the complete details about the NTSE Himachal Pradesh Answer Keys for the current as well as previous years. The State Council of Research and Training of Himachal Pradesh earlier released the answer keys after the termination of the exam and asked for the objections from the students until 30 November 2017. Now after receiving the objections and analysing the answer keys, the revised answer keys have been released. 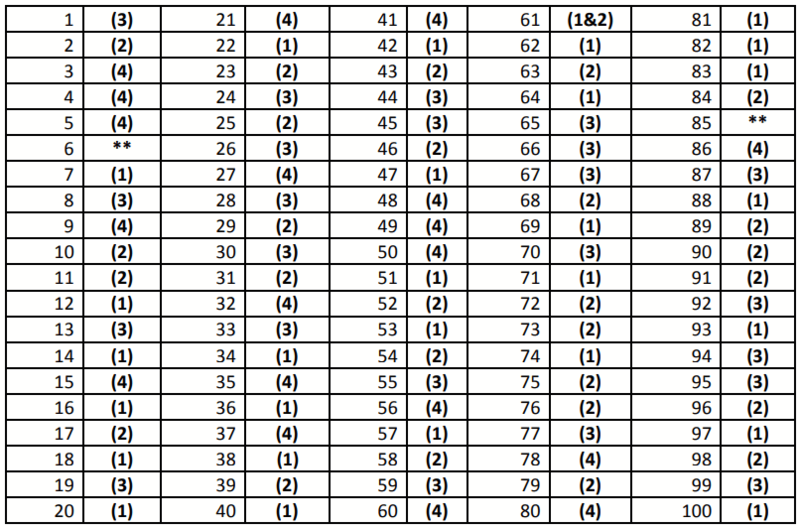 The revised answer keys are available on this page below. The SCERT, Himachal Pradesh has released the revised answer keys after receiving the objections from the candidates and examining the answer keys. The keys for some of the answer have changed, the candidates can compare it to the previously released answer keys. The total number of students to be selected in NTSE Stage 1 for the year 2017-18 as per state quota is 26. The revised answer key is given below for MAT, SAT and LCT. 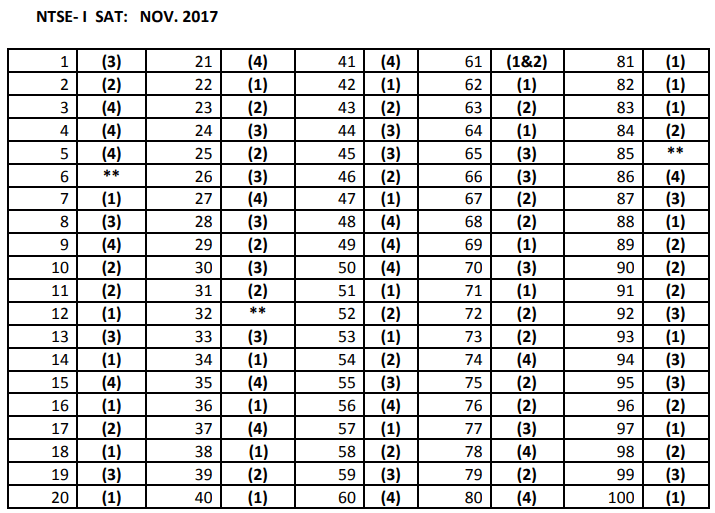 The NTSE Himachal Pradesh Answer Keys have been released by the SCERT Himachal Pradesh for the exam conducted on 5 November 2017. The candidates can check the answer keys and can send their objection regarding the same to the email id - ntsescerthp@gmail.com. The candidates should know that the objection must be submitted on or before 30 November 2017. The objections/ suggestions regarding the answer keys received after the last date will not be examined. After the NTSE Himachal Pradesh Answer Keys, the result will be declared. NTSE Result 2017 for stage 1 is expected to be declared in the month of December 2017. The NTSE Stage 1 exam was conducted on 4 and 5 November 2017. Once the result gets declared, the shortlisted candidates will appear in NTSE Stage 2 exam. The stage 2 exam is scheduled to be conducted on 13 May 2018. The candidates are suggested to follow the link below in order to get information on the result. 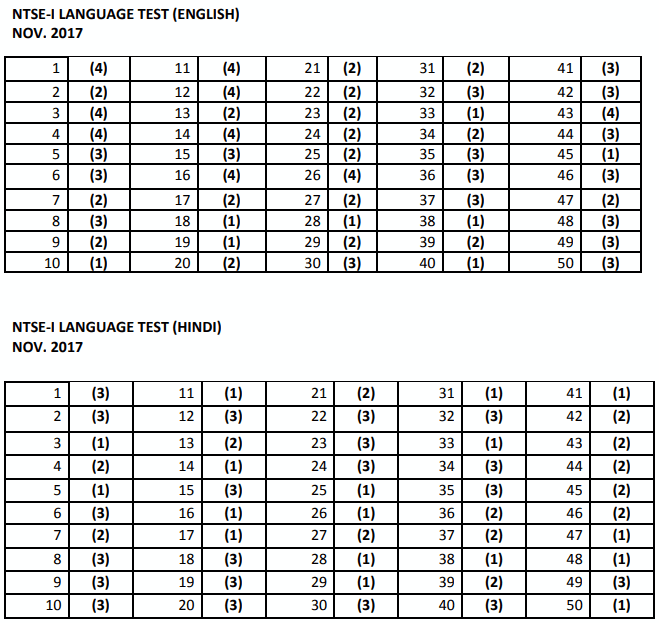 This page also provides the NTSE Himachal Pradesh Stage 1 Previous Year Answer Key. So that the candidates who are looking for the previous year answer key can find the same on this page. Candidates are provided with the NTSE Himachal Pradesh Stage 1 Previous Year Answer Key for each examination i.e Mental Ability Test (MAT), Scholastic Aptitude Test (SAT) and Language Comprehensive Test (LCT).